Leveraging over the skills of our qualified team of professionals, we are involved in offering Hydraulic Dab Press Machine. To meet the varied client demands, these presses are made available in multiple specifications. These presses are specifically designed to be operated manually. 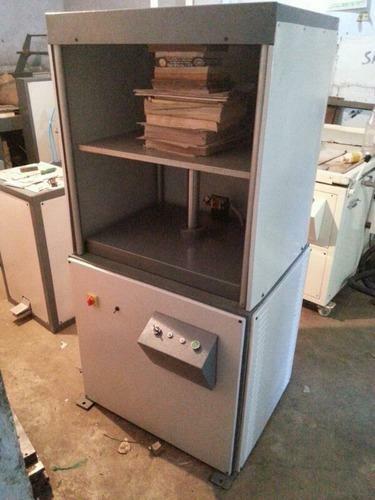 Maximum Platen Size	20"x 26"
Hyd. Power Pack	2 HP. New Morning Star Process Industry was founded in the year 1983 as an eminent manufacturer and supplier of Industrial Equipments, offered to meet to the various industrial applications. Under our product spectrum, we have assorted Cold Lamination Machine, Paper Coaters and Laminated Sheet Separator. Designed and manufactured in compliance with the industry defined norms at our ultra-modern infrastructure facility, these products are capable of providing constant and efficient performance along with minimal maintenance costs. Our offered products are easy to install and maintain, resulting in hassle-free performance for our valued customers, at their end. To cater our customers’ expectations and to bring forth optimum quality products, we have construct our infrastructure facility over a large area, equipped with upgraded range of machinery. In the process, our team is well qualified and comprising professionals with vast industry experience. Working with an objective to make our patrons satisfied and to offer efficient industrial equipments, we are engrossed in the specified domain with our dedication and maximal efforts. We are offering all these products at nominal market price in various specifications.